There’s a list being shared of ten things that will disrupt US education and I agree with Dan Willingham. 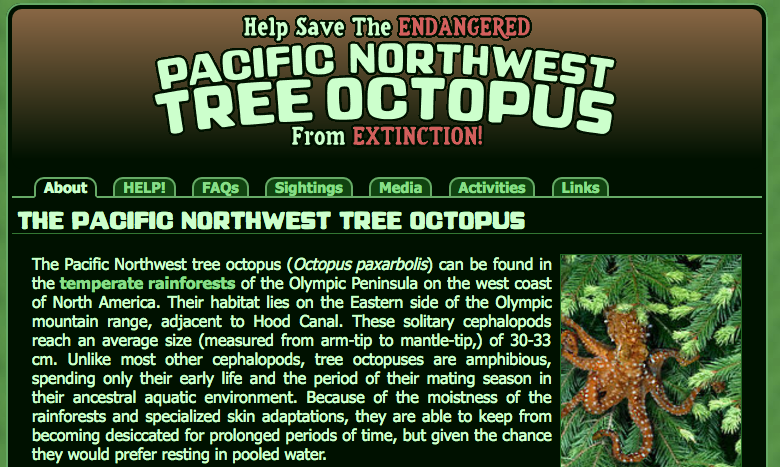 In no particular order, here are ten things that might actually disrupt US education. You do not enact law like No Child Left Behind if you fundamentally believe that teaching is a profession. You know who primarily regulates lawyers, engineers, and doctors – that’s right, in many countries they do that themselves. In some states elementary school teachers teach all subject areas and have a total of 45 minutes to plan AND are paid so little that many of them need second jobs. Although increased planning time may reduce this tendency, designing ambitious curriculum is difficult and extremely time-consuming, so most teachers would benefit from curated resources that they can modify and adapt using their professional judgement. Surprisingly, many teachers have to use Pinterest and/or Google to find resources for their classroom because of a lack of curriculum resources aligned to their new state standards. One way to make getting into teaching competitive would be to pay people enough that it makes teaching an attractive choice. It would also mean fewer people leaving the profession to find more lucrative careers and leaving vacancies, especially in harder to fill content areas. As Jim Stigler and notes in the Teaching Gap, much of US policy is engineered at supporting individual teachers at getting better and that as soon as these teachers retire or quit, their professional knowledge leaves with them and the profession of teaching in the US remains relatively unchanged. It’s a good thing for individual teachers to get better at their practice, it is better that the professional benefits from what they learn. In some school districts, schools spend $9000 per student while a few miles away in a suburban district, schools spend $26,000 a student. While this inequity exists, resources are unevenly distributed across US education and in most cases the students who need the most support to be successful receive the least amount of funding. In almost all large urban areas, it pays better to work in the suburbs than it does to work in the city. This results in teachers leaving the cities for high paying, lower stress jobs outside of the cities and in uneven amounts of teacher experience across the schools in the city. Imagine a system where the person who teaches teachers never sets foot in a school, the person who runs a school has no time to read research or even see their teachers teach, the person who runs research has never taught, the instructional coach who supports a teacher has their own idiosyncratic teaching style, and a teacher who has to listen to all of these people give them different advice on teaching. This is considered normal for teachers across the United States. But it does not have to be that way! It is possible to design systems where all of these people work collectively rather than individually. Income inequality in the United States is increasing and given that we know already that there exists a relationship between income and educational achievement, any shift toward more economically equitable society is likely to result in improvements in education for most students. The United States has a long dark history of oppressing people of color in various ways. One way this occurs in the US school system is that the schools attended by children of color are much more likely to be closed and/or labelled as failing than other schools. Ending this systematic oppression would transform the United States educational landscape. My colleagues have long been frustrated sharing our work at conferences primarily because the work we do is complex and hard for people to understand thoroughly within the constraints of a conference session where we only have at most 75 minutes to work on an idea. So we contacted the organizers of the two NCTM regional conferences and proposed a possible solution. Instead of running one session, we will run 4. Instead of 4 separate sessions, we will plan those 4 sessions to connect together. Given how closely my colleagues and I work, we were each able to be the lead speaker on a different proposal. 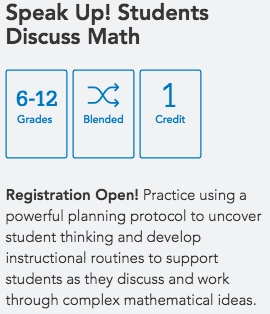 Both the NCTM Orlando and NCTM Chicago conference organizing teams agreed to this proposal and scheduled our sessions both so they do not overlap and also sequentially as requested. So although we have 4 separate workshops listed in the program guide, these sessions are actually one of our day-long workshops divided into four sessions. Our hope is that some participants will experience one workshop and be no worse off than before – they will still learn something even if it is not the complete picture – but that participants who attend multiple sessions will have more insight and ability to use our work. Here is a video of Contemplate then Calculate in action, with Kaitlin Ruggiero as the teacher and some teachers from one of our courses playing the role of students. In this session participants will experience the same instructional routine three times with three different tasks to consider what elements of the teaching that occurs are part of the routine and what elements probably depend on the task and the students. Next, participants will experience the routine again (this will give access to people for whom this is their first session) and name the parts of the routine, why those parts are helpful, and what questions they have about the routine. There is good evidence that a new teaching idea sticks better for participants if they have an opportunity to incorporate it into their existing teaching by planning and preparing to use the idea, so that will be the primary focus of this session. 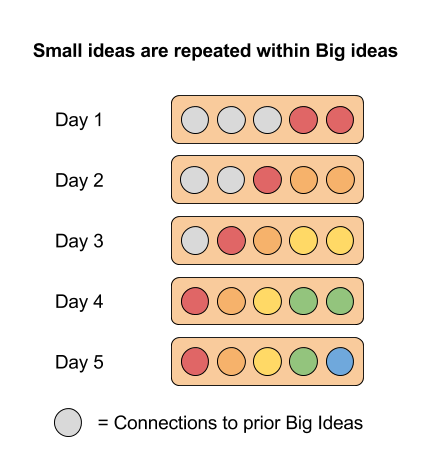 This will also connect the planning process for the instructional routines to the 5 practices for orchestrating productive mathematical discussions. There are two goals of this session. First that some participants will have an opportunity to apply what they have learned and actually practice using the instructional routine before trying it out with students. Second, rehearsal of teaching is a useful way to norm around teaching practice and to try things out in teaching in a lower pressure situation than with a group of students. • Does this curriculum assume that children will forget ideas over time? • Does this curriculum provide instructional supports that increase the odds that all children have access to it? • Does the curriculum assume all students are capable of learning and doing interesting mathematics? • Are the connections between different mathematical ideas made explicit, both for me as a teacher, and for students who will experience the curriculum? • Is it possible, based on the license and format of the materials, for me to extend / adapt / modify the curriculum based on student need? • Does the material make it easier for me to use formative assessment practices each day? If the answer to all of these questions is not yes, I don’t want to use that curriculum. A curriculum which is no more than a collection of tasks is no more useful to me than my ability to search for resources in Google. What other questions do you ask yourself when reviewing curriculum? There is evidence that students who have access to and understand how to use different mathematical representations of the same mathematical concepts are more successful learning mathematics than students who only have access to one representation type. The issue is that mathematical representations are not intrinsically meaningful on their own. Some mathematical representations are completely arbitrary and for others it can be challenging to determine to what elements of the representation to pay attention. The less than, equals to, and greater than signs are arbitrary. They are symbols to which we denote meaning and which otherwise do not contain any mathematical information without that meaning assigned. Another issue is that students do not always attend to the critical features of a mathematical representation. For example, I have often seen a shape and a formula for calculating the area of that shape introduced together, possibly like it is shown below with a calculation of area alongside the visual. But to what exactly in this representation do we expect students to attend? The most obvious features of the diagram of the rectangle that correspond to the area formula are the 5 and the 3. These refer to the quantities of length and width. But what is meant by the multiplication of those two quantities? How is this multiplication represented in the diagram? 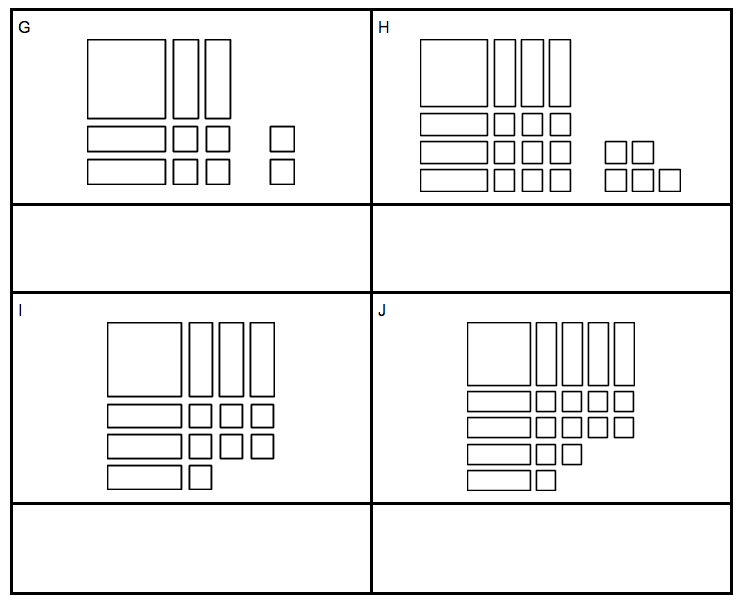 There is no special reason from diagrams like these that children will attend to the space occupied by the rectangle and match that to the area of the rectangle, so we need to find ways to draw their attention to this element of rectangles. Mathematical representations have potential power to subtly introduce ideas to students as well. The number line is a good example of a representation that is often introduced early and may lead to some powerful questions by students. What do those arrows on either side mean? What does the space between the numbers represent? What does going left on the number line mean? When does the number line stop? Each of these questions has a mathematical answer and the number line can again be used to represent this answer (warning: but not always very well). I worked recently with a group of teachers, and we looked for shortcuts to solving the equation x + x = 116 – 84. Here are some of their shortcuts. But what if we tried to represent Strategy 2 and 3 on a number line? 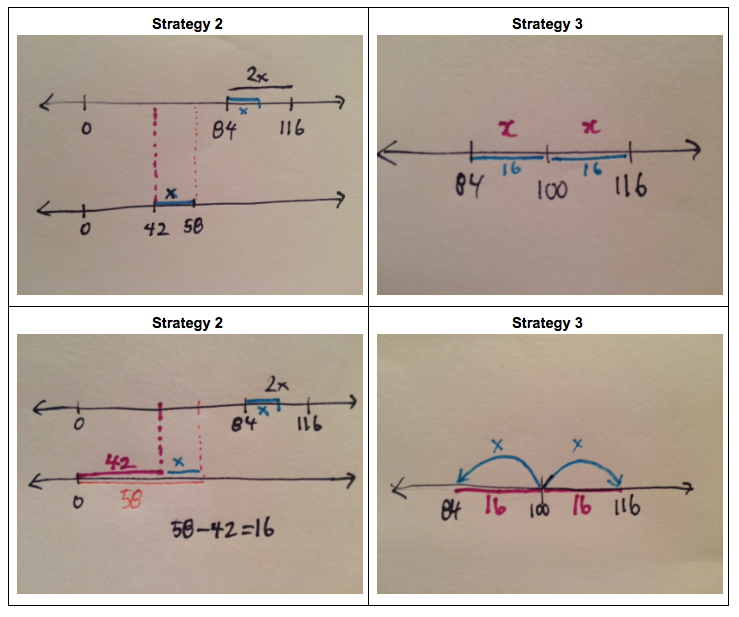 Here are a couple of different visualizations of these strategies. What information is captured differently by the different visualizations? 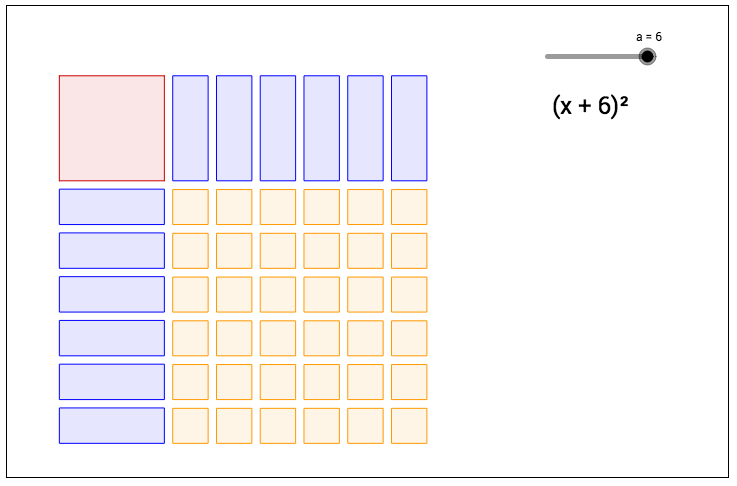 In our math curriculum, when introducing an area model for factoring and completing the square, we first introduce the representation itself before we do any other mathematical work using it. In a classroom setting, we could ask students to share their answers to this prompt with a partner and then we could ask some students to share their answers with the entire class. 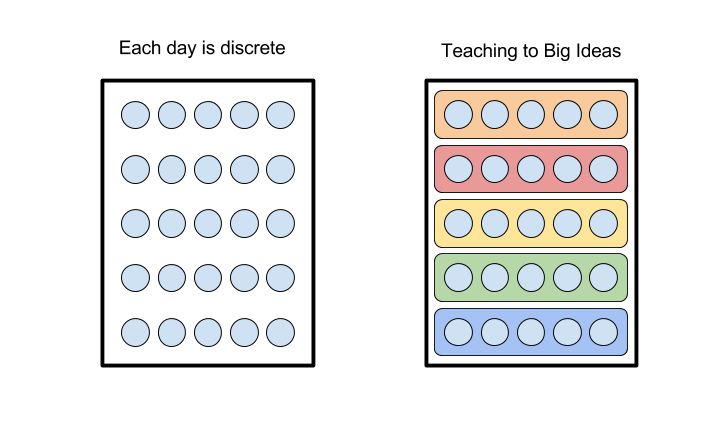 After this, if necessary, we could add an observation from another class, so that students know to what elements of this representation to attend. 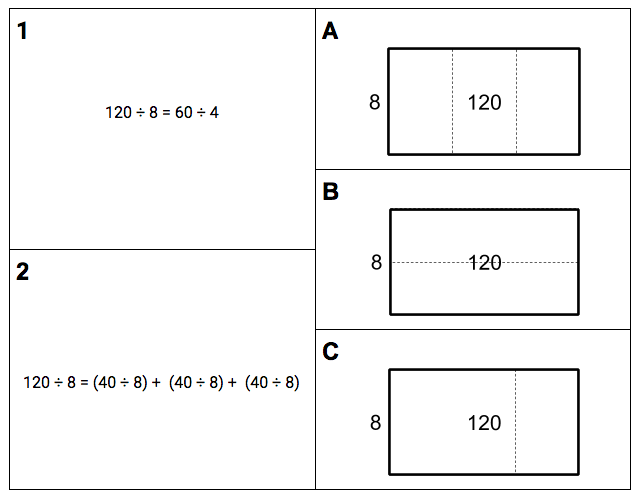 In my experience, this geometric approach to completing the square results in more students in having access to the algebraic approach, and makes the name of the algebraic strategy more obvious. 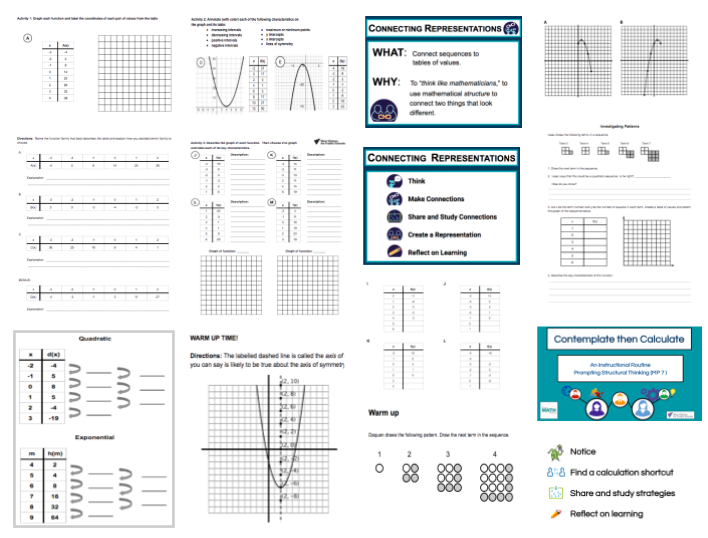 Mathematical representations can offer explicit ways for students to make connections across different mathematical topics. In our Algebra I curriculum, we do not have a unit on graphing. 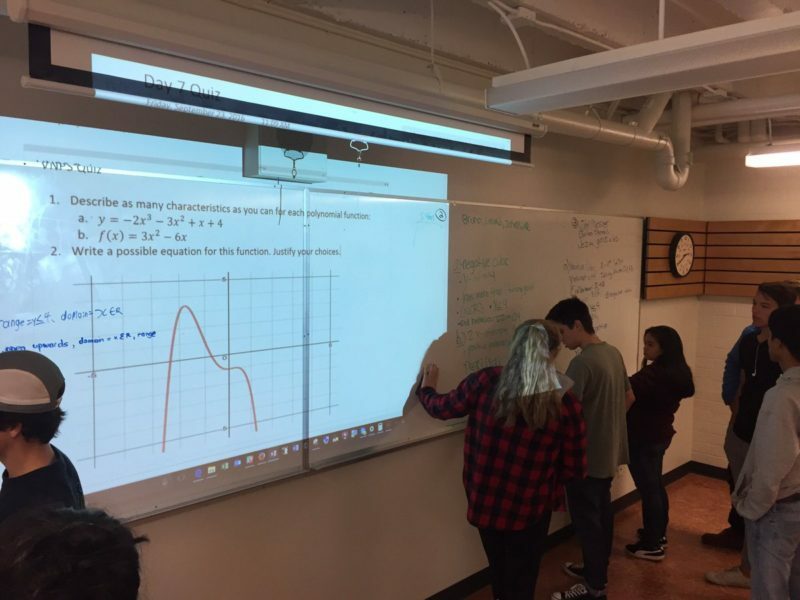 Instead interpreting and using graphs is part of all seven units, increasing the odds students make connections in and between those units and also that students remember key ideas from the course. Don’t assume that mathematical understanding is transmitted by the representation. 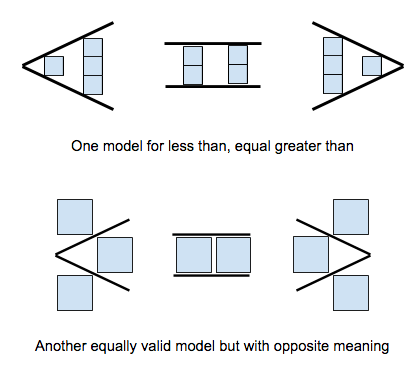 Some mathematical ideas are easier to introduce using some representations rather than others. 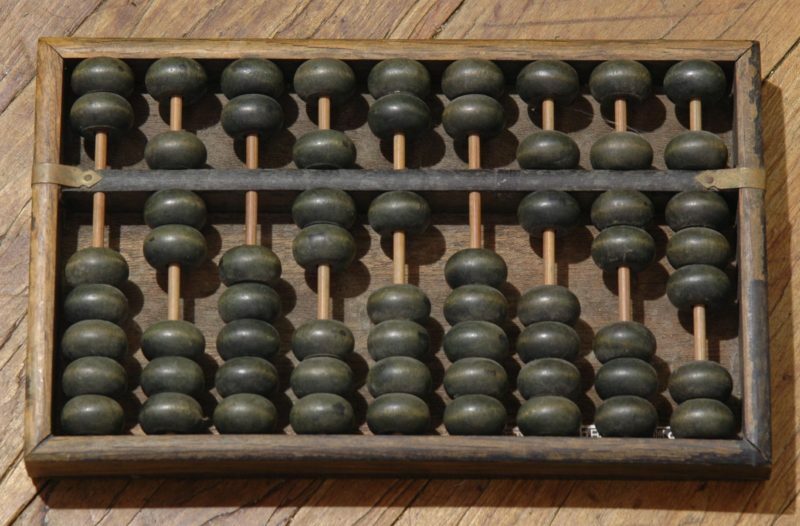 Reusing a specific mathematical representation over and over again will both help students make mathematical connections and remember key concepts from the year. This spring I’m going to be co-teaching two courses with Kaitlin Ruggiero on instructional routines. The first course will focus on using the instructional routine, Contemplate then Calculate, as a tool for learning how to use the 5 Practices for Orchestrating Productive Mathematical Discussions. The second course will focus on using another instructional routine, Connecting Representations, to better understand formative assessment strategies. These instructional routines were developed by Grace Kelemanik and Amy Lucenta. Connecting Representations is one of the routines described in their book, Routines for Reasoning. Both courses are structured as a one-day workshop followed by 5 weeks of planning and reflecting, in an online discussion forum, on the use of the practices and strategies. The fee for the courses is minimal, set at $25 for non-New Visions’ teachers. 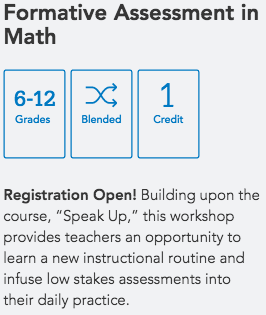 If you are a teacher in New York City, you can also pay a $45 fee to the NYC DOE and receive 1 p-credit for each course. I’m looking forward to teaching these courses and hope that some of you are able to participate!